A new feature soon to be released for League of Legends has you pick a role and then be put in a team with players of complementing roles. This should allow you to start games with a balanced team. Developer Lyte has provided further details on the new Team Builder matchmaker. “Team Builder, [is] a new feature coming to PBE in the near future where you can queue up for a specific role, champion and position and get connected with four teammates that also preselected their preferred role,” writes Lyte. “The goal is to build a balanced team where everyone’s in agreement on where they’re going and what they’re playing, and in doing so help lay the foundation for good teamwork. “Good teamwork doesn’t just start when the minions spawn or at the first big teamfight. It starts in champion select. 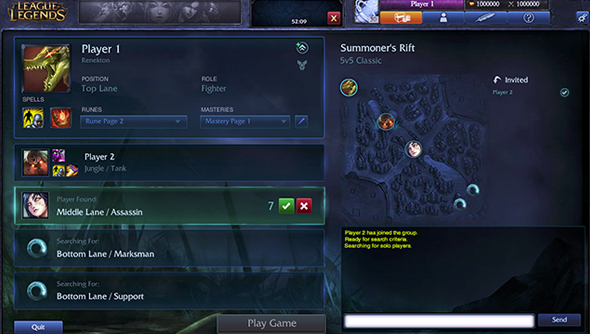 Champion select sets the tone of the game and greatly impacts whether you feel like you’re going to have a fun match. So we asked ourselves: what’s the ideal champion select? And how can we improve this process so it happens more often? Riot’s work doesn’t stop with just letting you select a role. The developer is “rolling out a smarter matchmaking system that can dynamically account for your experience with a given role, position or champion.” If you’re trying a character out for the first time or are new to a role then this will be taken into account. That way veteran players trying a new character in a less-played role won’t end up against experts. At first, Team builder will be kept separate from standard matchmaking. After a time it may be added to ranked matchmaking.